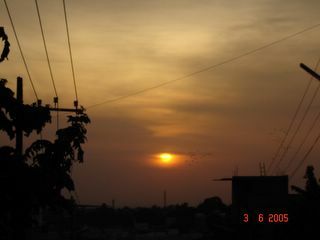 Sunset from atop a BWSSB water tank! This snap was taken standing on top of the BWSSB water tank in Banashankari 3rd stage. It was about 6-45 in the evening and was getting very dark. Climbing to the top of the water tank just to take the photo was really worth the effort. Thats a nice snap. Dont know where this is. Is it the BTM tank? BTW I am still wondering whether you require the date imprinted in the snap itself? @baejaar - thanks. this is the banashankari 3rd stage water tank. its nearer to the ring road that goes towards mysore road. ya - i've changed my cam settings not to record the date now.